As you build new roads, finding ways to speed up and improve the land surveying process can be extremely beneficial. After all, since roads tend to cover long distances, the process of gathering survey data can often be more time-consuming than it is on other municipal construction projects. In this post, we’ll examine how the use of drones for surveying can speed up this process and lead to faster, more efficient road building. The main problem with traditional land surveying techniques when applied to road building projects in that they take too long. Surveyors may find themselves having to cover long distances to collect all the needed data to support a project. In the time that this data collection is going on, the rest of the project will have to shut down to wait for the surveyors to return, leading to wasted time and resources. On the other hand, UAVs can cover long distances quickly, traveling as the crow flies, which makes them an especially good choice for road building projects. They are also able to relay information back to engineers in a central office while still in the air, instead of having to wait until they’ve returned to share the data they’ve collected. This practically removes the waiting period involved with gathering road survey data, and allows those engineers to proceed with their work immediately. Aerial mapping drones can contribute to greater safety in road surveying specifically because they are unmanned. Traditional land surveying methods require the surveyors to travel over land, often through difficult terrain that is hard to reach. Just being in such an environment dramatically increased the chance that a surveyor would be involved in a workplace accident. On the other hand, UAVs allow surveyors to conduct all of their data collection activity from the safety and comfort of a central office. 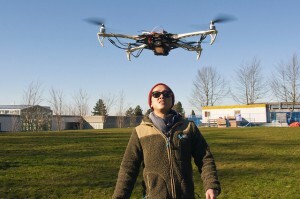 In addition, UAVs are safer than other forms of aerial data collection. While fixed wing airplanes can offer some of the advantages of UAVs when it comes to data collection, these planes usually have to be very small and fly close to the ground in order to operate effectively. As a result, it is impossible to fully ensure the safety of a person who has to go up in such a plane. By using drones for surveying, personnel can keep their feet planted firmly on the ground. While speed and safety are fairly obvious and straightforward benefits of using UAVs to support road surveying, many people fail to realize that these devices can also offer an impressive level of accuracy in data collection. Recent developments in high-resolution camera technologies have made it feasible to create drones that can reliably capture images with 1 centimeter per pixel resolution. 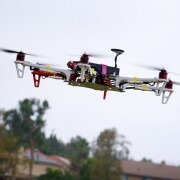 UAVs can also operate closer to the ground than fixed-wing aircrafts, allowing them to capture images from better angles. The high level of accuracy provided by UAVs can lead to a more effective road building project overall. Engineers can enter into a project feeling confident about the data they have in hand. In addition, by beginning the road building project with the most complete and accurate data possible, a company can dramatically reduce the likelihood that they’ll end up having to go back and make an expensive and time-consuming change to the project due to an error that came about because of bad survey data. If you’re ready to put the benefits of using an aerial mapping drone to work on your road building project, Landpoint is here to help. Contact us today for more details.